My first click-bait title. Aren’t you proud of me? As a conductor or librarian, it can be very difficult to find new repertoire for your group. We have certain modern composers who reach “celebrity” status by virtue of everyone wanting to perform their music and it helps to drive them deeper into the public consciousness. As this occurs, more and more pieces become part of our ensemble’s heritage and traditions, dotting concert programs for the rest of their history. One good example of this for choirs would be the music of Eric Whitacre. People had such profound reactions to his music that there was a cultural explosion throughout the 2000s, which raised its influence to the point where choirs worldwide began to seek this music out. Whitacre is only one of the many “superstar” composers who’s names reach almost mythic status and helps to sell their music to a broad base. Some of us also travel around with our groups to festivals, competitions and the like, and we get the opportunity to hear others perform. Myself included, conductors frantically seek out concert programs at these events in order to take the names of these newly discovered pieces home to their own ensembles. And of course, conductors talk to each other and share notes. With the exception of these main examples of music spreading socially, the traditional way of finding new music is through catalogues and other print-based materials. Conductors pour over pages and pages of information about new music and try to make their best guesses based on who wrote it, the listed difficulty, and many other factors. However, there’s always an element of risk when you buy a new piece of music for your choir or band that you haven’t seen or heard of it not living up to your expectations. This can be especially devastating to school teachers who are operating on very tight budgets. It is only in the past couple of decades that the majority of these catalogues have come with CDs to help conductors make more informed decisions. As good as this system is, it still doesn’t provide the opportunity to see a sample score and is nowhere near as efficient as using our society’s main source of research, the Internet. I find myself using the Internet almost exclusively to do repertoire research for my choirs. I am very grateful for the advent of music publishers who place listening tracks online, whether they are recorded or simply MIDI representations. It has been a especially pivotal tool in choosing repertoire for my church and community choirs. I’m also a huge fan of brand new music. The number of new composers out there is growing every day. I try to seek out music that has recently been written because I feel we often get stuck in the past when it comes to repertoire selection. We stick to these traditions that are comfortable and familiar but if we want this young, burgeoning community to thrive, we need to make a point to showcase new rep, and not just when we commission a new work for our group. All that being said, it can be frustrating that in 2015, with all the technology we have at our fingertips, there’s still a lot of music for sale online that has no way to listen to it or view it. This is a YouTube video of a piece called “Frozen In” by Dale Trumbore. I posted it on Facebook after I discovered it, commenting on how pleased I was to find such a good resource. I was shocked to see this video sponsored by Hal Leonard, as their website has not been historically helpful in trying to find repertoire. You see many examples of listening tracks that only play the first 30 seconds or give you the first couple of pages of the score. There’s risk involved in these as well and I have been burned many times by thinking a piece would be sufficient when it wasn’t. However, after seeing this, it really gave me hope that we’re moving in the right direction. A special shout out to two choral publishers who have consistently offered full recordings and full PDF “water-marked” sample copies: Carl Fischer and our own Canadian Cypress Choral. I can understand the argument of music publishers that if they put up the entire score online for view or even download, people will simply take it, copy it and not pay for it.This is always going to happen in our profession. I’m not saying it’s right (because it’s as wrong as you can get) but it seems to me an inevitability. Without PDFs online for download, the same people would simply buy the minimum ~6 copies from the publisher and then duplicate the rest to suit their needs. The risk of having music used illegally has and always will be an issue but I don’t think that utilizing technology to help conductors make better choices is going to necessarily grow that risk. Those types of people will always find a way to do it on the cheap. This is my request to composers and music publishers. Take a lead from Carl Fischer (who, by the way, has been doing it this way for years) and Cypress Choral. Put up a full viewing copy of the score, and if you must, block our ability to download it but I still want to see every page. Find a choir to sing through the whole piece and then put it up right next to the visual (or better yet, combined like the example above). These new composers will get far more opportunity to shine if conductors are able to do more effective research and my guess is that you will sell a lot more music. Please share this post with your fellow teachers, conductors and arts administrators. We’ve all done it. We’ve all copied something we shouldn’t. We make a lot of excuses for it, we claim to be using it only in a ‘fair use’ capacity, and sometimes our choirs are so broke and desperate that in order to make music happen, it’s either copy or be forced to search even harder for acceptable repertoire in the public domain (which there is lots to be found). Composers know it happens. Publishers know it happens. Sometimes a choral director at a disadvantaged school has to stand at the photocopier weeping like after a bad night of drinking, chanting “Never again!”. We all know it’s wrong and my hope is that as a choral community, we’re all working hard to minimize it as much as possible. All that being said, it doesn’t take a genius to realize that from a purely logical and moral standpoint, copying is bad for our art. I adore Canadian choral music. I’ll be honest, I’ve been an Eleanor Daley fan for a very long time and she motivates me as a truly Canadian choral hero. When I sang with the MUN Chamber Choir during my Masters, we travelled to Toronto and sang in her church. It was difficult to accept she was just a normal individual; even though my life as a chorister is relatively short compared to others, her name popped up a lot with the shimmer of celebrity. Standing in her presence, seeing her office where she wrote and continues to write, seeing her sitting at the organ while the congregation was just sitting and not cheering her entrance in a Justin Bieber type fashion; it was all very surreal. Hey, we’re all welcome to our obsessions, forgive me mine. Eleanor is just one of Canada’s most prized composers and all of these giants have paved a great road for the future composers of Canada’s choral music. Choirs who performed at Podium 2014 (naturally) had significantly featured Canadian choral works, some of them brand spanking new. I get a real charge from seeing the celebration of our own music and of these emerging composers who, with encouragement and support, will flourish for decades to come. I am proud to say that the Coastal Sounds Community Choir has had a policy in place since its inception that choristers would be responsible for purchasing their own music. It’s exciting for me to think that in the homes of all my singers, there exists a personal choral library that may one day be handed down to others who will celebrate it themselves. The choir subsidizes the shipping and a portion of the cost, so it does not become too much of a cost burden on the singers. Pieces often get reused, anyway. It becomes theirs for life, their markings and their notes. We must do what we can to support the Canadian composers and publishers who continue to furnish our art with beautiful fuel. You can help them and also help support my writing simultaneously by considering Sheet Music Plus for your music purchases. I have been using SMP for Coastal Sounds for many years and I have always had great success with them. Not only do they have a wide and assorted variety of choral music from a bevy of publishers (including Canadian ones), but their website is supremely easy to use. Most pieces come with inside peeks and often full recordings. There is also a very large digital print library where you can print your purchases for immediate use. I find the website is very handy for aiding in the research for new music, which is often already a time-stealing task. I appreciate any support I can get. We all normally do, and all should buy everything we use. Please consider buying it through Sheet Music Plus and supporting my website. 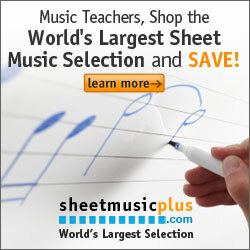 Whenever I mention a piece of music in my blog posts, I will link to its page on the Sheet Music Plus site. I have already collected a list of favourites from Coastal Sounds and other works I’ve conducted, which you can find here. Soon I will be blogging about the generous and passionate choral publishers we have in Canada and my positive experiences with them at Podium 2014. Thank you for your support and thanks for reading!